Ever followed some sort of healthy living regime or diet change and wondered why it never really worked? I want you to imagine something before I answer that. Picture yourself as a naturalistic health nut yogi who always recycles and only eats organic vegetables and herbs from the garden. Every morning, you go down to the kitchen, pour yourself a tall glass of fresh-squeezed orange juice, add a shot of RoundUp, and chug it down. And then you get a headache and become disappointed in how healthy living has let you down. What is healthy living, really? That story kind of helps to explain how I feel about holistic living. We try to live healthfully, and yet allow toxins to remain in our homes and on our bodies. By ignoring one aspect of life, we diminish the good we’re trying to do in every other aspect. It’s kind of like how well-known personal care corporations will run anti-cancer campaigns, but refuse to remove cancer-causing chemicals from their products, the products we put on our skin every day. By the way, I know we don’t go around chugging RoundUp… But did you know that we are consuming it? The United States uses RoundUp more than any other herbicide. Its active ingredient, Glyphosate, can cause infertility. It’s also an endocrine disruptor, meaning it messes with your hormones- the messengers of the body. From what I’ve heard, around 85% of all RoundUp is sprayed on corn, and 80% of that corn is fed to cows, and then the chemicals can be found in the beef you eat. Those toxins are then found in us. (source) Fun fact! Toxins are everywhere. And we aren’t getting well. We should start living holistically and hopefully. “Holistic” is defined as “characterized by comprehension of the parts of something as intimately interconnected and explicable only by reference to the whole.” In medicine, it means treating the whole person, rather than just taking care of outward symptoms. That’s the whole idea behind Naturopathic and Ayurvedic medicine, and something I think we should return to. Instead of the Western view, which sees us as machines, where you replace parts or take pills to keep broken parts working, Ayurveda says that we’re made from a Divine Light Force, intelligently created. Each one of us is an irreplaceable part of the cosmic plan. This is one thing that I’ve been convinced of by human design. In case you haven’t heard of it yet, human design is a ground-breaking personality tool that combines eastern and western astrology, the Judaic Kabbalah, the Hindu Chakra system, the Chinese I’Ching, and quantum physics. Related: Get your FREE human design chart! We’re complicated, awesome, multi-dimensional creatures. Our mindset can affect our physical health, and symptoms mean our bodies are trying to tell us something. They aren’t something to cover up with pills. If we want to start making healthy changes in our lives, my theory is that we need to come at is as if we’re making actual lifestyle changes. As in, changes that will affect more than one corner of our busy lives. That’s hard, especially for us busy Americans, but the end result is a thriving, happy existence. God made us so intricately connected- to the world and within ourselves, as body, mind, and soul. It’s unwise to forget about any one of them in the lifestyle changes we make. We need to incorporate all of who we are into the changes we’re making in order to see the greatest possible benefit from those changes. It’s a simple concept but hard to live out. I see people who obsess over losing weight, but they aren’t willing to let go of stressors in their life. They won’t even get adequate sleep. Or they want to detox their homes, but keep their toxic relationships. And then they think they can take a pill to solve all their problems. I could give you a hundred more examples but it all boils down to this- If we really are intricately connected, -body, mind, and soul- like I believe we are, then shouldn’t we act like it? And prioritize holistic living? 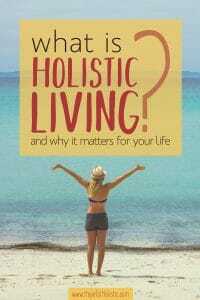 Most of us aren’t living holistically. Let’s clear something up here- you aren’t to blame for these decisions or misperceptions. The health industry has pumped millions of dollars into advertising telling you to trust and rely on pharmaceuticals, and doctors are trained to hand out medications. In fact, in America, 75% of patients that go to the doctor have no reason to see a physician. It’s minor issues that they could easily take care of themselves with the right knowledge. And 80% of those patients expect antibiotics. (Spoiler- they get them). Doctors will lose paying customers if they don’t hand out antibiotics, so what do you think they do? And since these patients don’t yet realize there’s another way, they are developing antibiotic resistance and creating superbugs. In short, we aren’t getting well doing the things we’ve been trained to do. Really, I’m thankful for the wisdom that doctors have. They are very well trained in medical intervention and life-saving surgeries, but there’s a whole other side to healthy living. America has forgotten what preventative health care really is. And sadly, corporations do all they can to keep the truth hidden, and they’ve made it dang hard to find out what we’re actually doing to ourselves when we rely on medications or chemicals. I’m thankful for the doctors that save lives every day, and I’m really, really thankful for the doctors practicing alternative medicine. These are the doctors who look for the root cause of illness and cure that, rather than handing out prescriptions to cover over symptoms. I think that first off, everyone should find a way to access a good naturopathic doctor. There are plenty of good choices out there, and they are willing to help people who can’t afford treatments. We also have to fight against the doctrine embedded in our culture, telling us that we’re machines, exactly the same, and that one pill will fix you. But we’re all different. So different. One natural remedy might not work for me the same way it works for you. But that doesn’t mean give up! There are options for natural, holistic wellness. Use elderberry syrup to help with sickness, instead of drugs. You can make your own non-toxic makeup. Clean your whole house without using chemicals. Learn about your human design. All the information you need to make lifestyle changes is available! We need to learn, and live, differently. And we need to do so hopefully. Living out of fear doesn’t really feel like living, it definitely isn’t thriving, and won’t make you live any longer. I believe that hope is behind every medical miracle, and that faith is essential to seeing real change come about in your life. And we have every reason to have hope! It’s not just trying to blindly figure out what our bodies need- our bodies are sending us messages. And our minds are smart. Science and research are going further than they’ve ever been before. So if you’re just starting out, or considering lifestyle changes, welcome! If you’ve been on this path for a while, I hope there’s something new here for you too! Wherever you are, I’d like to join you on your journey towards wholeness and wellness. None of us have all the answers. We’re all on a journey. There’s no overnight solution, and I definitely don’t live perfectly, but I’m finding joy and peace in the process. 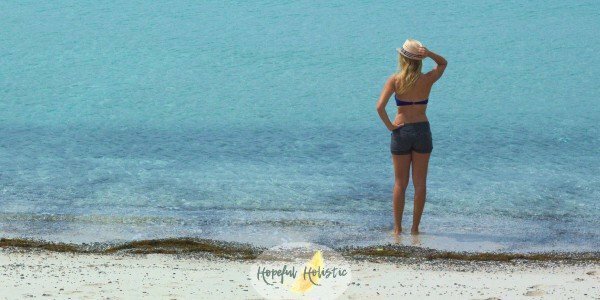 Along the way, I’d like to share with you the holistic solutions that I’ve found to benefit me, so that you can start experiencing the same benefits! For starters, make sure you sign up for my emails! I share more there than you’ll find on this blog. Don’t forget to give me a follow on social media too! On my Instagram page, I’ll share simple recipes and tips that you won’t see on the blog. And I’ve got loads more information over on Pinterest for you also! You can also email me directly at rachel@hopefulholistic.com if you have any questions. I’m here for you, and I’ll try to answer them as best I can! Thanks for going on this journey with me. I’m excited to learn and grow with you!